In May 2005, Dr. Stein was invited as Guest Speaker to the Annual Meeting of the "No-Scalpel Vasectomy Surgeons India" (see www.nsvsi.com), a group of Indian surgeons dedicated to making No-Scalpel Vasectomy readily available and logistically simple for Indian men. What follows is a narrative in the first person of my visit to India. The meeting was held in Gangtok, Sikkim, and dedicated to the late Dr. S.K. Pradhan. Dr. Pradhan lived in Sikkim and worked tirelessly to promote vasectomy services in his home state. Through his efforts, Sikkim became one of the few states in India in which vasectomy is more popular than tubal ligation as a form of long-term contraception. Given the simplicity and safety record of no-scalpel vasectomy (NSV) as compared to tubal ligation, this was as much a service to Sikkimese women as to the men of Sikkim. Still in his 50's, Dr. Pradhan died late last year of hepatic cell carcinoma (liver cancer). He will be sorely missed, but his work lives on in the dedicated NSV surgeons whom he trained and inspired. 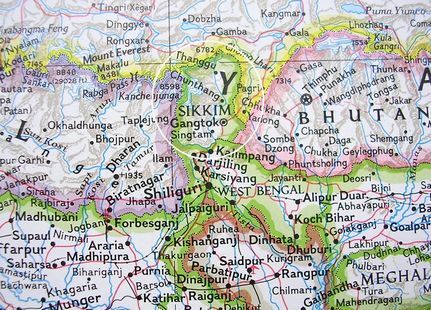 Sikkim is a small state, tucked in the Himalayan Mountains between Nepal and Bhutan. Most of its inhabitants speak Nepali, rather than, or in addition to, the Indian national languages: Hindi and English. Sikkim is so mountainous that it has no airports. In order to reach Gangtok, I and most of the other meeting participants flew to the airport in Bagdogra (near Shiliguri in West Bengal), then traveled four hours by road. Travel to Sikkim requires a special permit because it is a restricted area. India wishes to maintain good relations with China and does not want Sikkim to be a staging area for a Tibetan independence movement. As a result of these restrictions and the fact that much of the population is Buddhist, Sikkim is a very peaceful region with virtually no crime. Sikkim shares Mt. Kanchenjunga (also spelled Kunchenchanga), the third highest peak on Earth, with Nepal. Travel to Bagdogra brings one over scenic villages and fertile rice fields. The airport is very modern and located adjacent to an Indian Air Force base. Given India's burgeoning population, its roads team with life, color, energy, and crowded vehicles going everywhere. Early into our 4-hour road journey to Gangtok, our group dined at a Chinese restaurant on the 5th floor of a hotel across the roadway from a Buddhist temple, the first of many we would see in this region of India. I don't remember the name of this dish, but it was delicious! We soon entered the foothills of the Himalayas. The main road into Sikkim follows the Teesta River which forms part of the boundary between West Bengal and Sikkim (see map above). At the city of Singtam (important later in our trip as the site of our Post-Conference NSV Camp), we left the Teesta and took the main mountain road to Gangtok. The road was narrow and in some areas unpaved, but our Indian drivers were the best I have ever seen, confidently passing opposing traffic by margins of inches. We arrived at the Royal Plaza Hotel in Gangtok after dark. As I looked out the hotel windows the next morning, I was stunned. Imagine Shangri-la. The Royal Plaza is on a hillside overlooking the valley of a river which drains snowcapped Himalayan peaks. 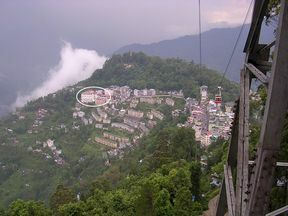 The center of Gangtok cannot be seen from the Royal Plaza, as it is on the west side of the left range. On the first day of the meeting, the first order of business was to bless the site. The meeting participants filed out to the parking deck of the hotel for a Buddhist ceremony of prayer and the smoke created by burning local shrubs. Good smoke widely dispersed was a good omen. During a meeting break, new acquaintances were made and established friendships renewed. greeted our cutest meeting attendee. Chairman of NSVSI, and Abrol. ... to a very receptive audience. The meeting room was decorated with inspirational posters. That evening, a pre-arranged "Sikkimese Cultural Programme" was followed by an impromptu Punjabi Music Programme. Cuts of our Sikkimese Cultural Programme. This girl was so charming. Our group was really blessed to have in our midst the talented Dr. Sham Singla, a virtuoso of Punjabi vocal music. When it comes to music, photos won't work. To really enjoy what we enjoyed, you need to click on these photos and download the audio/video files and start your media player. If your connection is slow, just hit alt-tab during the download and continue viewing the page while the music comes to you. When you hear the music, hit alt-tab again to enjoy the video. The Audience Became the Music. Dr. Baljit Beautified the Music. On the morning of the second day, most participants awakened early to watch the sun rise at a viewpoint of Mount Kanchenjunga. The taxis to the viewpoint arrived a little late to catch the sunrise, but the weather and views were spectacular. Drs. David Sokal, RMC Kaza, Sophie Hereish, Baljit Kaur, Doug Stein, and R.P. Sharma. ... and entryway traffic jams. ... and more spectacular views. ... and presentation of certificates: below Amodh Kumar for his presentation "Program Design and Community Mobilization for NSV". Mr. Mrityunjay Kumar, Mr. Amodh Kumar, and Dr. R.C.M. Kaza. A Post-Conference NSV Camp took place on the following day in Singtam, about 30 km from Gangtok along the Teesta River. was an announcement of the Conference and NSV Camp. Already a site of routine NSV services, the District Hospital of Singtam was geared up to provide vasectomies for many men throughout the region, encouraged to attend by their local health clinics. Turnout was excellent: 52 men treated on the first day! Dr. Wangchuk Tshering and I work together to provide no-needle anesthesia with a MadaJet spray applicator. Dr. Passang D. Phempu, State Trainer NSV Sikkim, was our host. Dr. Michel Hereish of Gaspesie, Canada and I pose after a long day. The District Hospital in Singtam. Standing and from the left, Dr. G.S. Jagadish and his wife from the southern city of Bangalore; Dr. Baljit Kaur, General Secretary of NSVSI from the northwest city of Amritsar, Punjab; Dr. R.M.C. Kaza, Chairman of NSVSI and the "Father of NSV in India", from Delhi; Drs. Michel and Sophie Hereish from the Gaspe Peninsula in Canada; Dr. Passang D. Phempu, State Trainer NSV Sikkim; and Dr. Wangchuk Tshering, NSV Surgeon, Sikkim. I spent rest of my last day walking the streets of Gangtok, a beautiful city perched on the side of a mountain such that nearly everyone has a magnificent view. Elevated crosswalks are like a staircase linking streets joined by hairpin curves. Taxis are everywhere, inexpensive and quick. Next day, the journey back to Florida began with the 4-hour drive back to the airport at Bagdogra, along the Teesta River, roadside monkeys hoping for handouts. The mountains gave way to flatlands, a bit of a relief after all those curves and unguarded drop-offs. The bustle of city life resumed in Siliguri, good preparation for the excitement of Delhi, sandwiched between a 3-hour flight from Bagdogra and the 15-hour flight to Toronto. This was the experience of a lifetime, made possible when my good friend Dr. Philip Li, who trained me in NSV in 1990, recommended me to Dr. Kaza when Philip realized that he could not serve on the NSVSI faculty this year because of a busy schedule otherwise. I will be forever grateful and indebted to both of these men for making this trip possible. The most uplifting aspect of the whole experience was witnessing the dedication of the members of NSVSI, who give so much of their time without compensation to staff NSV Camps throughout India. NSVSI has no counterpart of which I am aware anywhere in the world ... it would probably not exist without the tireless energy and dedication of Dr. Ramchandra M.C. Kaza, who has traveled to every district of every Indian state to teach NSV and to promote a procedure which contributes so much to the health and well-being of Indian couples. He is truly a hero of India and a role model for anyone involved in family planning programs worldwide. With 1.1 billion people, India is clearly a country in need of family planning services. Every year 7.5 million Indian couples arrive at a point in life at which they feel fulfilled the with number of children that they have had. The wife may be many years away from menopause and they feel a need for safe dependable long-term carefree family planning. Nothing fills that need like NSV. Even if only half of the couples choose NSV, that is over 3.5 million procedures per year! And nothing can fill the need for such manpower like NSVSI. If you would like to experience India professionally, and if you would like to contribute to one of the most worthy organizations on this planet, please consider attending the next Annual Meeting of NSVSI and participating in the NSV Camp that may follow. At the least, please become an international member of NSVSI to show your support.